As I previously mentioned I have two steps to outlining. Amazing…I know! I have a patient pending on this method–it’s such an original idea. 😉 The initial outline really just establishes the skeleton of the book(s) and I have a Scrivner folder (one per chapter) that gives just a few bullet points. When it comes time for the detailed outline, or as I create characters, places, and groups), I add meat to the bones. I still keep it simple (more bullet points). It’s a dynamic flow. In some cases filling out the detailed outline will cause a person/group/place to come into existence (sometimes just added to my master list, sometimes requiring a character study or place/group description. In other cases, it’s when I create this “thing” that I think about where would be the best place to introduce them, and I’ll open up the summary outline and add a detail bullet point for me to introduce them. The best way to illustrate the technique is with an example. I’m going to use the first chapter of Theft of Swords because it is a book that is already released and you already read the first chapter that was created from this outline on Amazon just click on the cover (to use the “look inside feature”). I suggest you look over this outline first then read the chapter to see how the various bullets play out. In the above, The Crimson hand came into being because I needed someone to rob Royce and Hadrian. I already had a powerful thieves’ guild in Colnora that Royce had once been a part of so creating another one in another city made sense. In fact, this is a revised outline that was enhanced during the Orbit rewrite. In the “original” there was no such scene. But feedback from my editor and the fans indicated that the book should start with an introduction to Royce and Hadrian so they came into existence. Now that they exist, they are fodder for future works. For instance when I wrote The Rose and Thorn (coming out September 17, 2013), I was now able to “tap” this newly created group and provide more about them in that story. But as I said it goes the other way around. The city of Colnora, the political parties, and Degan Gaunt already existed and I was making sure I touched briefly on them here. Putting them in the detailed outline of chapter 1 book 1 may trigger my mind to some ideas I have for other books further down the line, so I’ll open their initial outlines and put some bullets in them as well. Because I write chronologically most of these detail points will go to future books, but it can go the other way around as well. For instance, when doing the simple outline of book #2 I needed a powerful knight. Since my “places detail” already indicated that the best knights come from Chadwick I created Enden and it made sense for Archibald to use him as bragging point – so that made me open up book #1 and make a note for Archibald to mention him. In the same way, Breckton is a major character for book #5 so it made sense to put a reference to him there as well. These “little threads and details” aren’t supposed to be noticed by the reader of book #1 – but in a re-read people will see the connections that were there all along, lurking beneath the surface. It provides the Easter Eggs that makes the re-reads more fun. One other point I should make. There is much that the detail outline doesn’t cover that will affect what is written when it comes time to start that chapter. For instance, in Archibald’s character study I note that he really hates anyone calling him by his nickname “Archie” so I’m able to work that detail in to the exchange with Victor in this first chapter…both as a way for Victor to get under Archie’s skin and also to set the stage for something that will come up time and again throughout the series. It didn’t show up as a bullet point here – but as I started writing other books I would review their detailed outlines and see if there were places that made sense to have similar exchanges. This would cause me to add some more bullet points right before starting that particular book. Well I hope this helps to understand my process a bit. In the next post I’ll talk a bit more about the character studies. Interesting insight into how you outline. I’ll certainly take something away from this in terms of the “points to make” part. I’m outlining at the moment and my chapter summaries are just events. Points to make would help flesh them out. Thanks. Glad you found it helpful. Good luck with your own writing. Thanks for doing this blog! I’m looking forward to following along as you write your new series! You are very welcome. If it ends up helping anyone then it will be worth it. I use scrivener as well. My outline is a stepsheet, Each bullet point is a scene, and I include the general flow of tension, individual character goals, etc. Scrivener is a great tool. I highly recommend it. Thanks for the great tips on outlining! I’m looking forward to reading your new series. Thanks Kristen – I fixed the link. 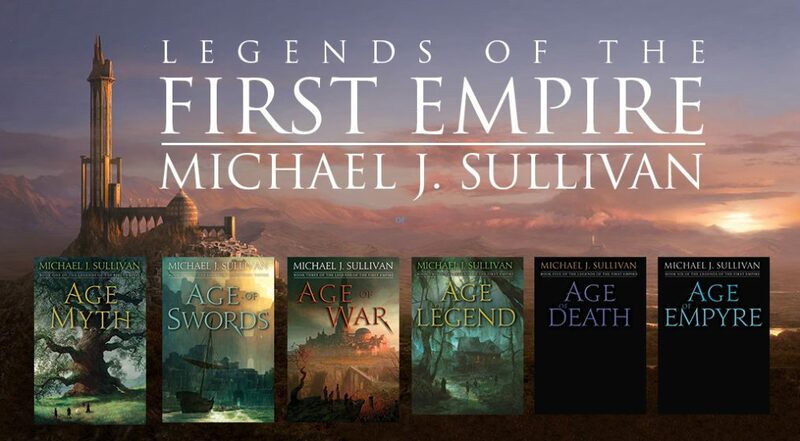 Talented author Michael J. Sullivan has begun journaling his writing process on WordPress. He’s been in the writing game for a long time and built up quite an audience with The Riyria Revelations, an epic fantasy series that was a self-publishing success. His skills eventually led to him being picked up by a traditional publisher. I’ve reblogged an insightful article on how he outlines his stories, but I highly recommend you Follow the whole blog.